Pedas are Indian desserts traditionally made out of freshly reduced milk solids. They are sweetened with sugar and flavored with saffron, gulkand(rosejam), mango and nuts to create different varieties. 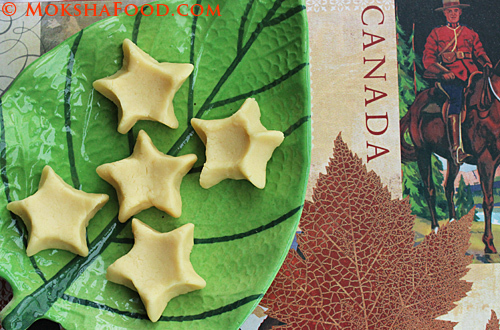 I experimented by infusing the khoya with Canadian maple syrup to create an Indo Canadian fusion dessert. This is an easy 2 ingredient, sugar free dessert which can be put together in a jiffy. I used store bought khoya. 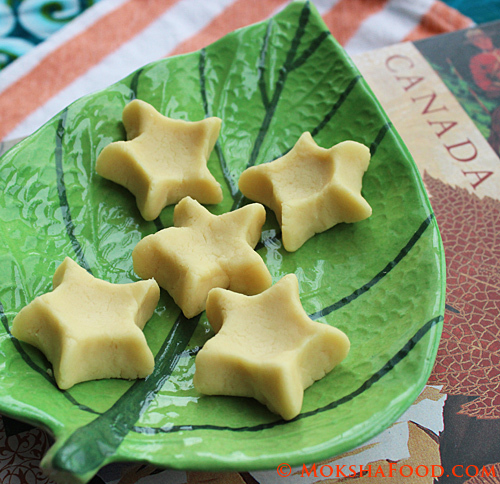 If using fresh homemade khoya, you could skip microwaving it. Grate the khoya finely in a bowl. Microwave for just about 10 sec to warm it up so it softens as it starts releasing its natural fat. Add the maple syrup one tsp at a time and knead the khoya till it becomes soft and pliable. Shape into desired forms. I rolled it into a ball. Flatted it with little pressure and then pinched the edges to form a star. Serve as it or refrigerate and eat later. It stays good for about a week if it last that long. This is a healthy, easy dessert which can be made anytime and served for any occasion.